The 'Marshal Shaposhnikov' Project 1155 large anti-submarine warfare (ASW) ship being upgraded at JSC Dalzavod Ship Repairing Center will get the ability to use Kalibr cruise, anti-ship and anti-submarine guided missiles, the Center for Analysis of Strategies and Technologies (CAST) writes in its official blog quoting the Dalzavod`s acquisition plan for 2017 published online. The point 601-EP of the document says that JSC Design Bureau of Special Machine-Building (KBSM, St. Petersburg) is to deliver by September 2018 two 3S-14 universal vertical launch systems (VLS) in the 3S-14-1155 configuration that provide the ability to launch Kalibr missiles. Moreover, the 570-EP point of the document says that JSC Concern Morinformsistema-Agat will have delivered one kit of the control system of the 3R-14 universal shipborne firing complex in the 3R-14N-1155 configuration by July 2019. Therefore, 'Marshal Shaposhnikov' is slate to receive two 3S-14-1155 universal VLS with 16 cells and a control system for them by 2019. The Kalibr complex comprises the 3M-54 (NATO reporting name: SS-N-27 Sizzler) family of anti-ship missiles, the 3M-14 land-attack missiles and the 91R1/RT2 anti-submarine missiles. In 2016, it became known that this large ASW ship would be also fitted with the 3S-24 launchers of the Uran missile complex. According to the information published on the official web site of the joint information system in the area of acquisitions, an agreement between JSC KBSM and Dalzavod to deliver two such items was signed in March 2016. The 3S-24 angling launcher is fitted with four 3S-34 containers that can use the 3M-24-family (NATO reporting name: SS-N-25 Switchblade) anti-ship missiles. The 'Marshal Shaposhnikov' ASW Destroyer prior to its upgrade. At the International Maritime Defense Show-2015 (IMDS 2015), then-acting Commander-in-Chief of the Russian Navy Admiral Viktor Chirkov said that "large ASW ships have been included in the modernization program, they will be fitted with modern missile complexes". He pointed out later that the ships would get the missiles of the Kalibr and Oniks families. At the KADEX-2016 show, the Vice President of the United Shipbuilding Corporation (USC) for Military Shipbuilding Igor Ponomaryov said that the rearmament of the Russian Navy`s large ASW ships with Kalibr missile complexes was not started yet. In January, it was reported that five Project 1155 large ASW ships of the Northern and Pacific fleets would be repaired and upgraded at the shipbuilding enterprises of North and Far East through 2022. A huge amount of work to update life support systems and radio-technical equipment of the ships will be fulfilled. By using the aforementioned information, it can be assumed that the angling launchers of the Rastrub-B (SS-N-14 Silex) anti-submarine guided missiles will be replaced by the 3S-24 angling launchers of the Uran complex. Two 3S-14 underdeck universal VLS will be installed instead of an AK-100 naval gun and its nose-mounted ammunition space. The modernization of the large ASW ships will extend their service life by 30 years at least and provide the Russian Navy with a sufficient number of ships through commissioning into service of the Project 23560 destroyers and Project 22350M frigates. The Project 1155 large anti-submarine warfare ships (Udaloy-I-class destroyers) are intended for ASW actions in green waters, providing support to the Russian Navy`s submarines and defensive screening of surface combatants. They have a full displacement of 7,570 t, a length of 163.5 m, a maximum speed of 32 knots and a cruising range of 5,000 nautical miles (at a speed of 14 knots). 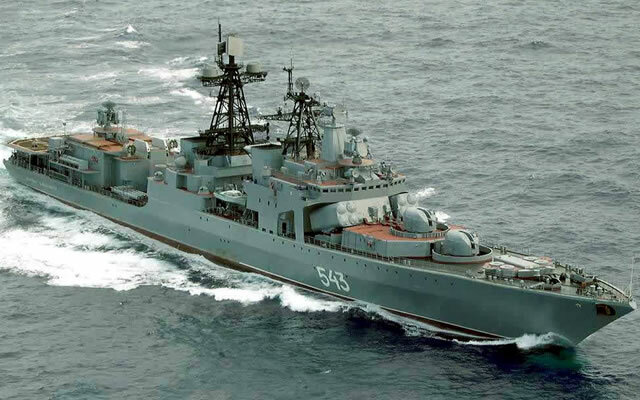 The Project 1155 large ASW ships are armed with two 100 mm AK-100 naval guns, anti-submarine weapons, surface-to-air missiles and 533 mm torpedo tubes. It can also store two Ka-27-type helicopters.